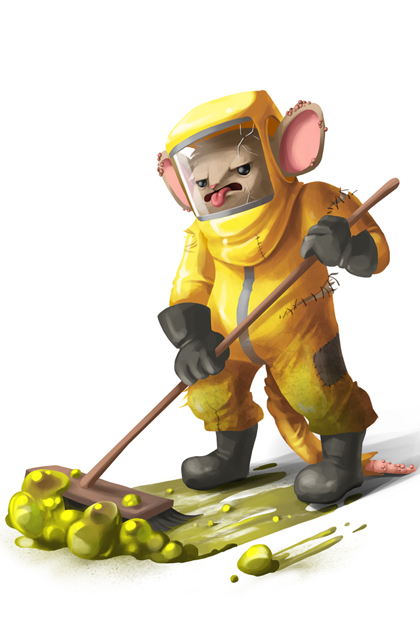 The Lab Technician Mouse is a breed of mouse found in the Toxic Spill, for hunters of rank Hero and above. It is known to drop a variety of loot. Contaminated but still completely devoted to the clean, the Lab Technician Mouse does his best with what he has to work with! Since he has already been exposed to the toxic elements, he just grabs whatever is left in the cleaning closet and makes the most of it! He should be alright as long as he rinses off a little afterwards, right? The Lab Technician Mouse is especially attracted to Rancid Radioactive Blue cheese, to the point that any other kind of cheese will simply not suffice. Additionally, these mice are only encountered when Rotten or Super Rotten Charms are in use. Hydro type traps such as Oasis Water Node Trap or Phantasmic Oasis Trap are effective against the Lab Technician Mouse. The Lab Technician Mouse drops the Clean Egg and Toxic Spill Egg during the annual Spring Egg Hunt. 21 January 2014: The Lab Technician Mouse was released as part of the Toxic Spill location. 15 April 2014: The Lab Technician Mouse began dropping the Clean Egg and Toxic Spill Egg as part of the Spring Egg Hunt 2014 event. This page was last edited on 15 September 2018, at 12:57.